(Left) Emmerson Mnangagwa and Nelson Chamisa. 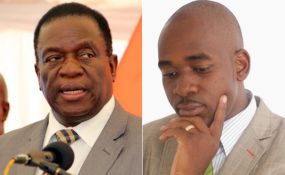 MDC leader Nelson Chamisa on Monday claimed he trounced President Emmerson Mnangagwa with a 57.10 percent share of the national vote against the latter's 42.10 percent in the hotly contested July 30 presidential election. He was giving oral evidence before the Kgalema Motlanthe chaired Commission of Inquiry into the August 1 post-election violence which saw six civilians shot and killed by what is widely believed were armed soldiers deployed into the CBD on the fateful day to quell wild protests by opposition followers. Chamisa is under fire for allegedly inciting his followers to invade the streets to protest alleged poll fraud by the Zimbabwe Electoral Commission (ZEC) on behalf of Zanu PF. He appeared before the probe team on Monday where he told the panel his hands were "clean" on the skirmishes. The firebrand opposition leader insisted he had no reason, at the time, to urge his followers to invade the streets in protest over an electoral outcome that he was very confident favoured his candidature, according to a parallel vote tabulation exercise performed by his party. In the past, Chamisa has adamantly claimed he won the election but has not suggested any figures. But he finally did that on Monday in a lengthy address to the commission which was also televised on ZBC TV. "We had the parallel voter tabulation ... because the presidential election results were counted first before any other result; so by midnight, the election result was known across the country," he said. "We also had our own way of ascertaining that result. Mr Mnangagwa knew that result and the result was very clear we had 2,674,032 votes, Mr Mnangagwa 2,008,690 votes." Chamisa said he was confident the result as calculated by MDC, tallied with that which was automatically inputed in the ZEC server. He accused ZEC of deciding to abandon using any information from the server in place of a Microsoft excel spreadsheet which allowed the poll management authority to manipulate the outcome. However, results announced by ZEC gave Mnangagwa 50,8 percent of the national vote with Chamisa, his closest challenger, getting 44.3 percent. The opposition chief further claimed that Mngangagwa and his government had printed 4 million extra ballot papers which they intended to clandestinely fill in and later present with the Zanu PF leader as winner. According to the country's electoral laws, it is an offence to announce the results of the country's polls ahead of official announcement by ZEC. The MDC has refused to recognise Mnangagwa as the country's duly elected leader with the impasse turning nasty last Thursday when police officers stormed the legislative chamber to drag out dozens of opposition MPs who had refused to stand up as a sign of respect to the country's leader. Mnangagwa had come to the house to listen to Finance Minister Mthuli Ncube's 2019 budget statement. He vowed at a party rally Saturday that parliament shall maintain the controversial method of dealing with his defiant opponents for as long as they continued to display contempt towards his incumbency.